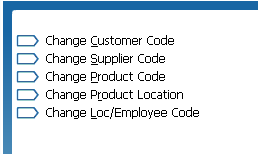 Did you know you can change Customer, Product, Supplier, Product Location and Payroll Codes? You are also able to make them Inactive! Product, Customer and Supplier Codes are accessed via Tools / Company / Change MasterFile Codes, whilst Payroll Codes are accessed through Masterfiles / Payroll / Change Loc / Emp Code. You will need to be the only Attaché user logged in and have the required password level to access these functions. Making the change is very easy. As you can see below, for Customers – Search and select the Old Code (Current) and then type in the New Code, choose Accept and it’s done! We talk about it often …. Before you proceed with changing your codes – BACKUP! If, in the unlikely event something doesn’t happen, you will have a current and valid backup to restore. For those using Clearview, you will also need to run a repair / process code changes on your file. This will ensure that Attaché and Clearview are in sync.